Elvers squirm in a bucket outside Delaware Valley Fish Co. in Portland in April. The Atlantic States Marine Fisheries Commission voted Monday to reduce Maine’s 2015 allotment of American eel landings by more than 2,000 pounds, according to a state official. The interstate commission’s eel management board, meeting in Mystic, Connecticut, set a statewide quota for next year of 9,688 pounds, according to Maine Department of Marine Resources spokesman Jeff Nichols. Last year, the board set a limit of 11,749 pounds of eels in Maine, which is the only state on the East Coast that has a sizable fishery for elvers, which are young eels that swim from the Atlantic Ocean into freshwater rivers and lakes. 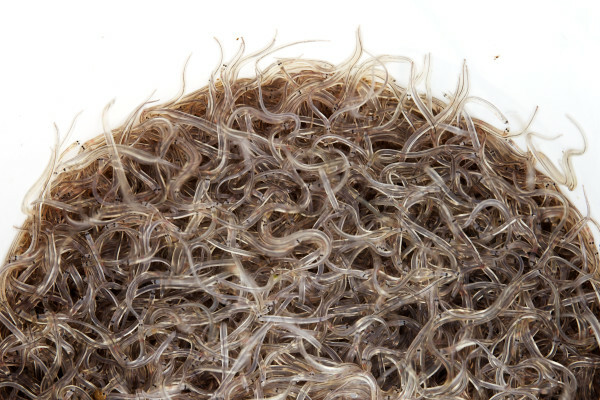 Elvers represent the second most valuable commercial fishery in Maine after lobster, with elver fishermen statewide earning a total of $32.9 million in revenue for their elver landings in 2013. The commission has sought to place tighter limits on Maine’s annual elver fishery since a 2012 stock assessment of the eels’ population determined that the species is depleted in American waters. Fishing for other life stages of the eels is permitted in Maine and other states but occurs at a much smaller scale. Though the quota for Maine this year was set at 11,749 pounds, the 9,688-pound cap set Monday by the board for next year matches the amount that actually was harvested in Maine this past spring, Nichols said. Nichols said that Maine’s 2014 elver landings total likely was affected by a two-week delay in the start of the annual springtime season. The start of the season was delayed because state officials had to implement management measures that were approved by the Legislature not long before the season was set to begin, he said. Cold weather at the start of the season also had an effect on the number of elvers caught in Maine, he added. Nichols said Patrick Keliher, commissioner for DMR, had hoped to get the same quota for 2015 that the state had last year. But Nichols was quick to add that a cap of 9,688 pounds for Maine is better than zero, which is what some other states first suggested during discussions on eel management measures last year. “We were hoping for the status quo, [but] it is better than what we were looking at [a year ago],” Nichols said. A call placed Monday evening to the Maine Elver Fishermen’s Association requesting comment was not immediately returned.